ARC Restoration and Windows Palatine, IL (certified for IL) has achieved the status of Authorized Home Builder for GAF (Residential Roofing Products Division), North America's Largest Roofing Manufacturer. ARC Restoration & Windows has successfully met the required standards, achieved the status of IKO ShieldPRO plus+ member in IKO's Residential Roofing Contractor Program and is entitled to enjoy the full benefits thereof. Haag Education Co. certifies that the person named on this certificate attended the Haag Certified Inspector – Residential Roofs V2 program. 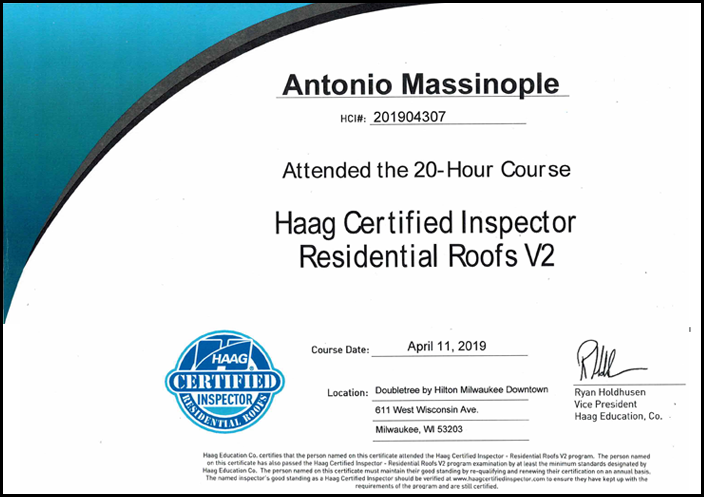 The person named on this certificate has also passed the Haag Certified Inspector – Residential Roofs V2 program examination by at least the minimum standards designated by Haag Education Co. The person named on this certificate must maintain their good standing by re-qualifying and renewing their certification on an annual basis. The named inspector's good standing as a Haag Certified Inspector should be verified at www.haagcertifiedinspector.com to ensure they have kept up with the requirements of the program and are still certified.